White Orchid is the brilliantly unusual video slot from IGT, featuring an abundance of in game features and free spins round. This jungle themed utilises IGT’s established 1043 ways to win structure, something that we have rarely seen on any modern video slot. The whopping amount of pay lines plays perfectly into players looking for a game that pays well, yet gives them the opportunity to vary their stakes accordingly. White Orchid also offers players a whopping 25,000 coin top prize, making this a true big hitter in the slot community. At first player you will wonder what this slot is actually based on, and to be fair, we don’t know either. The whole game is full of pink blossoms, jungle folk and animals with the design look more like a cheap comic strip than an intricate IGT slot. The romantic sound effects and mediocre animations finish the design off fairly nicely, but the slot is by no means an exciting play. The wild symbol within White Orchid is represented games logo and substitutes for all other symbols within the game (except the scatter). The great thing about spinning the games wild is that it becomes stacked when present on the reels, allowing for a host of winning opportunities. There are also scatters to look out for within the base game, represented by the White Orchid. Spinning two or more within the reels will pay out a decent amount and three or more will activate the awesome free spins round. The amount of free spins rewarded depends on the White Orchids on show and it is possible to retrigger all the way up to 130 times! 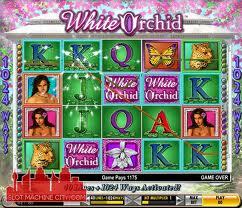 White Orchid is essentially a traditional video slot, but with a lot more to offer than its rivals. The 1024 ways to win structure can be pricey if the coin size is on the heavy end but this game should appeal to the masses due to its high payout rate. You can get stuck into this whopping video slot at the very best online casinos that this awesome developer sponsors.